This New Jersey helicopter flight is a double whammy for beach bums. During the 30-minute excursion, you and a special someone soar high above both Ocean City and Atlantic City. This New Jersey helicopter flight is a double whammy for beach bums. 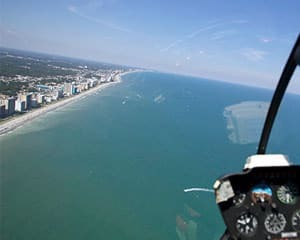 During the 30-minute excursion, you and a special someone soar high above both Ocean City and Atlantic City. Big boardwalk views, spectacular beach sights, stunning resorts and oceanside properties—see it all from high above the horizon. There’s a lot to capture so make sure you have a camera on hand. Want to move in a little closer to snap the perfect shot? No worries! Just ask your pilot and he’ll award you with that million-dollar view! Enjoy a 30-minute Atlantic City and Ocean City helicopter tour! Travel above the Tropicana Casino and Resort. See the historic Absecon lighthouse. Follow the world-famous Atlantic City Boardwalk. Travel to Ocean City’s award-winning beaches. Snap shots of the giant Ferris wheel. Soar high above the Music Pier. Be awed by unmatched ocean views! This helicopter flight lets you see it all without having to rethink your busy itinerary. Take to the skies today!